I cannot quite place when I started disconnecting from my life, it was a gradual process. I’m not sure anyone notices these moments in real time. They creep in like a cat trying to find a warm place in the sun, and before you know it, it makes its home with you; or at least that’s how it happened to me. I came out of the womb as a lover and a fighter in September of 1978. From day one, I believed that everything was possible and that when things went wrong, you fight for justice. I was passionate, confident and had an insatiable desire to make things better. I could always see possibility in even the hardest circumstances. These values served me well as a student and had me thinking about a career at a very young age. I would flip flop from wanting to be an astronaut to a politician to a film director based on what was inspiring me in that moment, and I believed it was all possible. It was people who inspired me. At an early age, I was fascinated with personal stories of people who had overcome difficult mountains in their lives. I remember reading about Steven Spielberg’s humble beginnings sweeping the studio floors in Los Angeles and serving the people around him, and Bob Dylan’s story of schlepping gear in New York City until he had an opportunity to sing his own songs on stage. But I always knew that there were more to these people’s stories of ‘making it’. I knew it wasn’t just hard work, there had to be more to their stories. There’s always more. Depression, addiction, heartbreak, the rises and falls were what interested me most. Those who overcame these hurdles and became healthier, more wholehearted human beings fascinated me. So it was to my own surprise even after finding an incredibly, fulfilling career in the music industry in Nashville, that I was experiencing a drab, unhealthy, disconnected season of life. This was not how I planned things. I was in my early thirties and I didn’t even recognize myself when I looked in the mirror. Somewhere along the way, I had consumed my fear and pain, much of it unconsciously. I was overweight, seemingly alone, incredibly uncomfortable, and unhappy. I actually remember the moment I realized this. It was an excruciating kind of uncomfortable to sit with myself, and not know how I got to this place. Unfortunately, I had to land in that same place a few times before I found a way to drag myself out. There was only one antidote: choosing to be present in my own life, even when things were not emotionally comfortable. I decided to keep it simple and do the opposite of what I had been doing. So three years ago at 269 lbs., I started running, because in some alternate universe, that made sense to me. Running gave me confidence, and I began to peel back layers of myself that I hadn’t seen in years. I was inspired again. I had hope again. The sun started peaking through the clouds, and I was running towards it. I would work through my emotions during runs, and although I didn’t understand how it worked, it was working for me. After losing about half the weight I wanted to lose, I realized I was still struggling with drinking. I was numbing and using alcohol as an escape, and I could tell I was losing control. I began having dreams where I was super fit, and running down these long stretches of country road, and I was flying — these were not 15-minute miles. Something clicked one day in my head and my heart and I reached out to a friend with a few simple words. “I want to quit drinking.” My friend had a startled look, because like most people in my life, she didn’t know I had a problem. She simply said, “Ok.” Then I said, “Ok” — and with that exchange, I began a new journey of clarity. Brené Brown says, “We can choose courage or we can choose comfort, but we can’t have both.” It was time to choose courage. I read an article by Johann Hari that said this: “The opposite of addiction is not sobriety. It’s human connection.” There it was in black and white. I set out on a journey to reconnect with myself and others. In a year’s time, I learned how to sit with being uncomfortable and I embraced uncertainty, instead of looking for an escape. In this process, I found myself honoring my uniqueness, and practiced being gentle with myself — we don’t do nearly enough of this. We spend a great deal of time focused on forgiving others, and not enough time forgiving and honoring ourselves. If we truly believe we were created uniquely, then it’s worth exploring and cultivating a plan to expand and share our uniqueness with the world. I also realized that I had believed lies about how people perceived me. I’ve learned its good practice to confront the lies we tell ourselves, and check in with reality. Most of the time, it’s our insignificance speaking. My fear of what people thought didn’t go away, but I learned that I could move forward in pursuing my feelings in a healthy way in spite of my fear. I learned that I could choose connection over numbing myself, and as I waded out into deeper waters, I noticed my confidence growing. I went seeking spiritual intimacy and along the way, I learned how to listen in my prayer time instead of always asking or supposing. I learned that if you pay attention, this world is speaking to us, people are reaching out to us, and there really is a much bigger plan that we fit into. I’ve noticed when I give myself grace, room for healing, and approach myself with a gentle spirit; I’m more willing to do the same with others. I’ve incorporated the importance of breathing. I realized that I spent most of my life holding my breath when I was stressed, now I consciously breathe through these moments. This may sound simple, but it really has changed my health. I’ve learned that it is not my responsibility or burden to rescue anyone. Read that again, we all need to fully understand that. I scribbled this down the other day: “You cannot run from your story, it will chase you, tackle you and put you in a headlock.” Oh, how true this is. I used to believe that pushing through was the way to the other side. I dare to propose that instead, we make a conscious decision to walk back through the rubble of our stories and pay attention to what we see. When we choose to do this, we find compassion for ourselves, and strength to move forward. Below are three excerpts I return to often from the writings of one of my favorite poets, Mary Oliver. They remind me to pay attention and embrace it all. 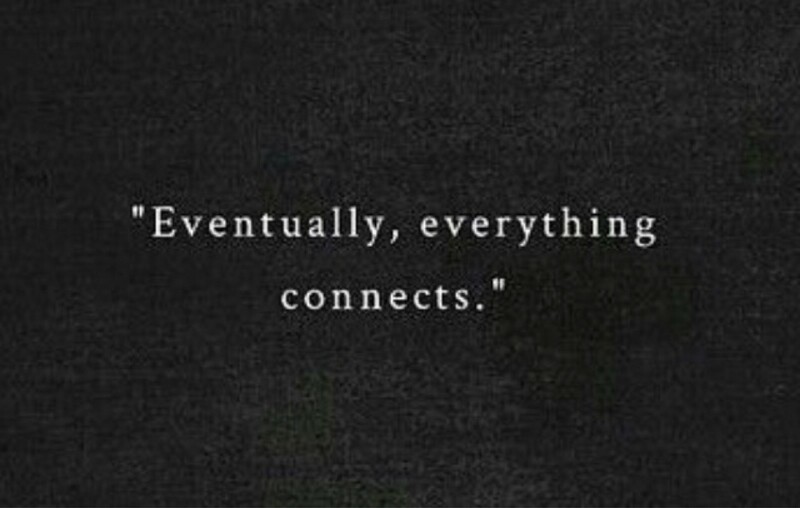 Eventually, everything connects.